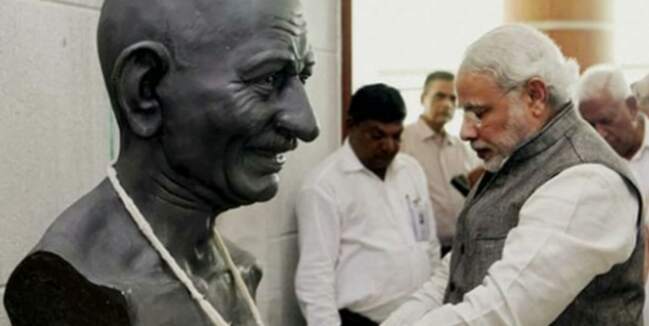 Prime Minister Narendra Modi on Monday paid tribute to Mahatma Gandhi, the Father of the Nation, on his 69th death anniversary. “Tributes to beloved Bapu on his ‘Punya Tithi'(death anniversary),” Modi tweeted. President Pranab Mukherjee, Vice-President Hamid Ansari and Modi paid tributes to Bapu at Rajghat in New Delhi. An inter-religious prayer will also be organised to mark the day. Later in the day, Urban Development Minister Venkaiah Naidu will inaugurate improvement works at Gandhi’s Samadhi. Gandhi is admired across the world for his nonviolent philosophy of passive resistance. He was known to his many followers as the Mahatma. On this day in 1948, Mohan Das Karamchand Gandhi was assassinated by Nathuram Godse, a Hindu nationalist, who fired three bullets into his chest during a prayer meeting at the Birla House.